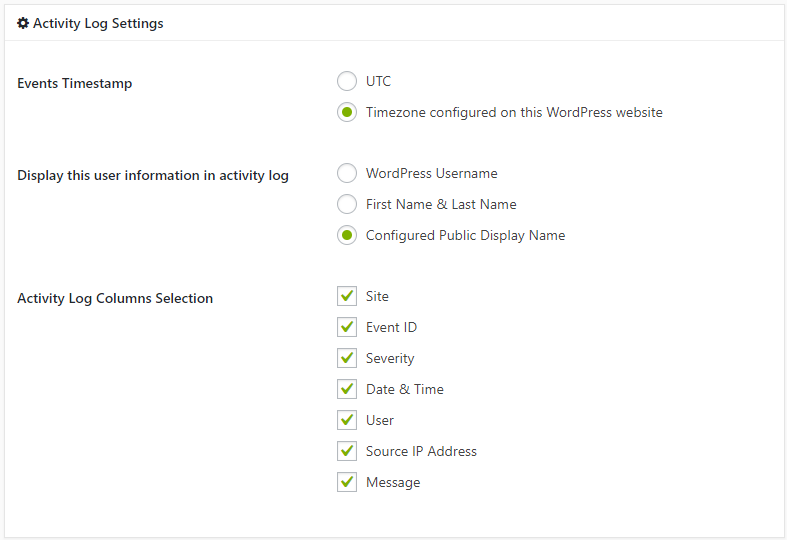 Activity Log for MainWP is an extension for MainWP, a popular WordPress sites management platform. The extension keeps a log of the changes that happen on your MainWP dashboard and allows you to view the activity log of all child sites in one central place – the MainWP dashboard. This page explains how you can configure the extension. For more information about its features refer to the Activity Log for MainWP extension page. When you install the activity log extension on MainWP it retrieves activity log events from the child sites and displays them in the central activity log viewer in the dashboard. The extension uses the same secure communication channel the MainWP dashboard uses – via the MainWP Child plugin. By default the plugin retrieves the latest 100 events from the child sites every three hours. The extension also keeps a log of such event – it reports event ID 7711 when it starts retrieving the events, and event ID 7712 when it is finished, as seen in the below screenshot. Refer to the list of audit log event IDs for MainWP for a complete list of events the plugin uses to keep a log of changes on the MainWP network and dashboard. You can specify how many events the extension retrieves and how often from the Activity Log Retrieval Settings section. Note that the more events you retrieve the longer the process will take. Click the Retrieve Activity Logs Now button to retrieve the logs from the child site without waiting for the automated process. You can add or remove the activity logs of child sites from the central activity log. This is needed in case just started managing a new website, or maybe you no longer manage a particular one and you have to remove its activity logs from the MainWP dashboard. This section explains how to add or remove sites from the central activity log. 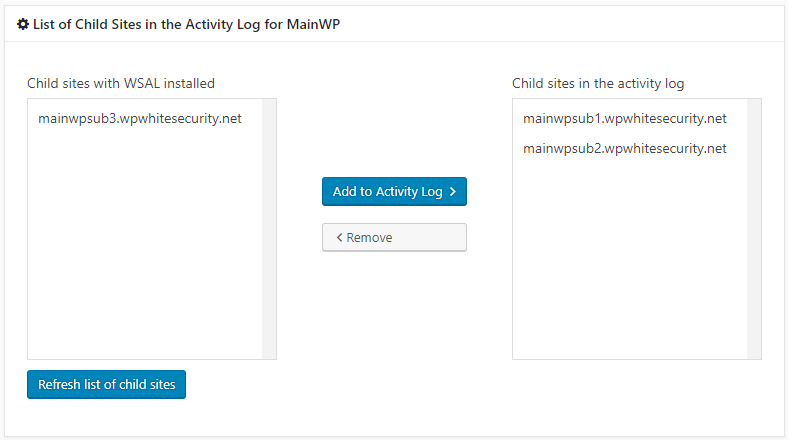 If WP Security Audit Log is not installed on the child site, install and activate it. Refer to the getting started with MainWP activity logs for more information. Navigate to the Activity Log for MainWP extension settings in the MainWP dashboard (MainWP > Activity Log > Extension Settings). Scroll to the bottom section List of Child Sites in the Activity Log for MainWP. Click the Refresh list of child sites button and the new child site which has the plugin installed will show up in the list. Select the child site by clicking on the name and then click the Add to Activity Log > button. Click Save Settings and the extension will automatically start downloading the activity log from the newly added child site. Select the site name from the Child sites in activity log list. Click the < Remove button.